When Simon and I were asked by Sian Meades at Qype London and Editor of DomesticSluttery.com to host an event with Jim Haynes, we did a double take. We re-read the email. Then we started yelling! We were dancing, like the dancing baby from Alley McBeal, like MC Hammer, Vanilla Ice, Salt & Pepper – not mastering the moonwalk just yet! Today, the invites are sent out and you can put yourself down to attend here on Qype. There will be 40 of us - plus Jim! 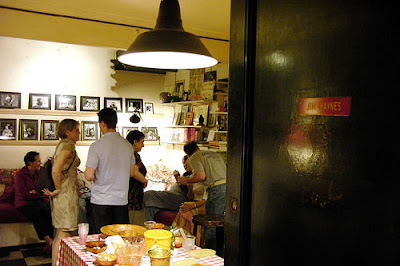 When we started to do supper clubs in October 2009, we had no idea at the time or even hoped or dreamed that in six months time, the godfather of Supper Clubs – Jim Haynes would host an event with us. How coool is that? !!! 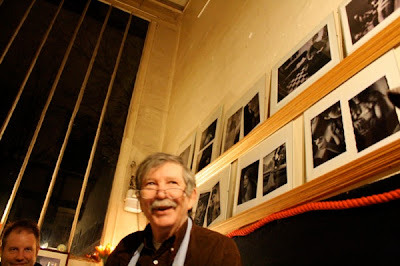 Jim Haynes has opened his Paris apartment every Sunday to around 70 strangers for over 30 years, apart from some summer weeks, ‘when I am at the Edinburgh Festival’, says Jim on his website. The king of networking describes how he likes having people standing around so that they are not stuck with each other the whole night and how people have formed relationships and families by meeting at his supper club events. Jim did a TV commercial for After Eight late last year for their new campaign but apparently, no one believes that Mr Haynes is a real person. You can watch a small clip where Jim talks about his supper clubs here or you can also view more about Jim and his life and works on his website. For this event, we are going to do it Jim’s style and get rid of all the tables and chairs. Guests can mingle around and meet others. There will be a mixologist who will be shaking lots of cocktails and we will be serving food that you can enjoy standing up. We’re going to play Bossanova, Sergio Mendes & Dusty Springfield and create the atmosphere of Jim! Hopefully the spring weather will be kind to us and we can flow into the garden where the herbs will bust lovely smells all around and the flowers are blossoming in their pots and the lemons are saying – squeeze me squeeze me! And we can all chat to Jim whose coming from Paris that morning just to attend this event. This is more than an honour. What a great man. We’re going to shake his hand and I hope he will kiss mine.